Use this report to review a student's progress in the Fast ForWord exercises, along with a list of errors made by the student within each exercise. The Student Averages chart (implementation) includes student activity for the weeks in the date range. The Completion History graph includes all student activity, with the student activity for the days in the date range highlighted in blue. The Progress table includes student activity for the weeks in the date range. For information on navigating and customizing this report once it's opened, see Navigate teacher reports. Click the Fast ForWord button at the top of the Results page to view Fast ForWord reports. If needed, select your school in the Browse by School column on the left, or click your school name in the district report. If needed, select your group in the Filter by My Groups column on the left, or click your group name in the school report. Select the student's name in the group report to view the Progress History report. Choose a Fast ForWord product from the Products menu as needed. This chart provides a summary of how well the student is meeting the Fast ForWord product achievement goals for the selected date range. Students who consistently earn high ratings and meet achievement goals typically gain the most benefit from the Scientific Learning products. The achievement scores—completion rate, attendance, and participation—measure Fast ForWord product implementation by comparing actual achievement against achievement goals. Completion Rate. How quickly the student progressed through the program when he/she used it, relative to the expected completion rate. For more about this score see Completion rate. Attendance. How many days per week the student used the program, relative to the scheduled days per week. For more about this score see Attendance. Participation. How much time the student spent using the program, relative to the scheduled minutes per day. For more about this score see Participation. Alerts. The number of current intervention alerts for the student. An intervention alert indicates that a student requires immediate attention. To learn more see About report status updates and alerts. Intervention alert details appear in the Progress table section of this report. Alerts are date sensitive, so you may see "N/A" in this field if your date range does not include the current date. Protocol. The upper right corner shows the protocol that the student used when working on the Fast ForWord product. Protocols provide specific training schedules for the student. To learn more see Fast ForWord program protocols. If the student used more than one protocol within the selected date range, "Mixed" appears in this field. Note: When calculating the student averages scores, if the date range is more than one week, the scores will represent an average of the total weeks in the date range. For example, if the date range is Last 4 Weeks, the scores will be an average of the last four weeks' scores. See About report date ranges for details on how date ranges work. These longitudinal graphs visually track a student's progress within each exercise over time. 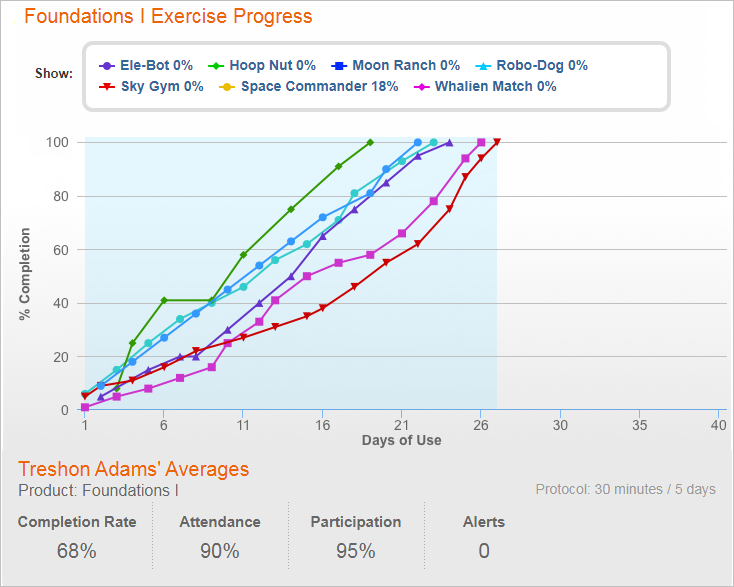 Each graph maps the student's percent complete score in an exercise for each day of participation in that exercise. Additionally, the graphs in this report visually track a student's progress within an exercise over time, which can help determine a student's standing within an exercise or the Fast ForWord product as a whole. X-axis. Maps the participation days, or the number of days the student has worked on each exercise in the Fast ForWord product. This number does not necessarily correspond to calendar days; for example, weekends are not counted unless the student actually works on a Saturday or Sunday. The actual training days in an exercise are marked with a dot. The blue background highlights the data that falls within the date range (set at the top of the report). Y-axis. Maps the student's percent complete score. Each point corresponds directly to the scores in the Student Percent Complete History report, illustrating the student's progress within an exercise over time. Each graph lists the current percent complete score next to the exercise name. This score, along with the exercise graph, is a high-water mark for the exercise. For example, if a student completes 36% of an exercise, then begins to do poorly and regresses in the exercise, the percent complete score continues to reflect that 36% of the exercise has been covered. If you look at the graph for this exercise, the highest point mapped will be 36%. By default, the graph maps all exercises in the product. You can choose which exercises to include in the graph by choosing the exercise names (in blue) in the legend at the top of the graph. This table indicates the student's progress scores in the Fast ForWord product, along with a few other status details. % Complete: Goal. This score indicates the percentage of the Fast ForWord product the student should complete this week. If the report date range is more than one week, this score is an average of the total weeks in the date range. For example, if the date range is Last 4 Weeks, the goal will be the average of the last four weeks' goals. Completion goals are unique for each Fast ForWord product and protocol, and typically vary week to week. Completion goals also expect that the student will complete the protocol each week. To learn more see Fast ForWord program protocols. % Complete: Actual. This score indicates the actual percentage of the Fast ForWord product the student completed this week. If the report date range is more than one week, this score is an average of the total weeks in the date range. For example, if the date range is Last 4 Weeks, the actual score will be the average of the last four weeks' actual scores. % Complete: Overall. This field displays the percent complete in the Fast ForWord product, from the start of the product to the end of the selected date range. To view a student's total percent complete in the product to date, change the date range for the report, or see Completion History graph. Status. Any current status updates and alerts for a student. An intervention alert indicates that the student requires immediate attention. If you see a status update or alert icon in this column, click it for detailed recommendations. To learn more see About report status updates and alerts. Status updates and alerts are date sensitive, so this field may be blank if your date range does not include the current date. Last Used. This field shows the date of the student's last training session on the Fast ForWord product. Note: This section is not yet available for the Foundations I or Foundations II programs. This section provides completion details for each exercise in the Fast ForWord product to date, breaking down the information for each individual level. The Last Participation date in the exercise header indicates the last date that the student worked on the exercise (this field will show a dash if the student has not yet worked on the exercise). Click the yellow arrow next to each exercise name to view the following information. To view the results for all exercises at one time, click the Expand All option at the top of the section. Not Started. The material has not been started yet. In Progress. The material has been started and is currently in progress. Some exercises provide a percent complete while in progress—hold your cursor over the icon to see that percent complete score, when available. Goal Not Met. Advancement criteria were not met at this pass through the material, and it may need to be repeated. Look to the following line for completion status. Complete. The advancement criteria for the material have been met. Percent Correct. For some exercises, this column appears and displays the percentage of the level that was answered correctly. This percentage may not be enough to complete the level. For example, a student may have a score of 100% correct, but that student may have only taken one trial in the level. To meet the criteria for advancement, the student may need to take (and pass) 20 trials. For a few of these exercises, this value is separated into two content categories, with the percent correct shown for each category. Number of Trials. This column displays the number of trials worked on in each level. For a few exercises, you will also see columns for the number of help trials, the number of grids, or the number of advancement trials, when applicable. This section lists the student's errors in each exercise (if any) for the selected date range. Each report breaks down the errors for the different levels within an exercise, allowing for targeted intervention strategies. Click the yellow arrow next to each exercise name to view the following information. To view the results for all exercises at one time, click the Expand All option at the top of the section. "He is looking up and the branch of a (tree, helmet, wasp, fire)." Correct out of Attempts. This column displays the number of correct attempts out of the total number of attempts made in that content. For some exercises, you may see errors for a specific grammar or syntax rule, when applicable. To view a student's most recent errors in each of the Fast ForWord exercises, see the following report: Student Errors Last Participation Day report – Fast ForWord. The error reports only list the content with errors. If you don't see content in the report, it means that the student did well with that content and did not make any errors, or that the student did not work on the content within the selected date range. To review all of the content in an exercise or Fast ForWord product, use the teacher manuals. MySciLEARN does not provide error reports for the sound exercises in the Foundations and Literacy Series products (such as Sky Gym and Moon Ranch in Foundations I, and others). Only the word-based exercise errors are included, as they can help provide insight into a student's mastery of grammar and syntax rules. For information on a student’s mastery of the sound exercises, see Completion Report Details. In addition to the usual print and email options for the Progress History report, MySciLEARN allows you to print and email specific sections of the report. For instructions see Print reports and Email reports. The Reading Assistant legacy program has been discontinued.